When writing computer programs, there’s a tradition of having your first one say “Hello World.” So that’s the title of this shot, which is from my first roll of homemade 120 film. To make film, you just need two things: an emulsion and a base. The base was easy. Estar Melinex, a 7mm polyester film made by DuPont, is not too hard to source. (I picked it up about two years ago from Photographer’s Formulary.) I decided that I wanted the emulsion to be something I made from scratch, and a few weeks ago I decided to finally make some. This is a basic emulsion: Kevin Klein’s basic emulsion over at The Light Farm. It’s a very simple emulsion; a great place to start. Before you start, it’s important to think through the end of this process. You’ll need to work under a safelight; you’ll need to refrigerate (or at least cool to 50 F) the light-sensitive emulsion; and the vessel you’ll be mixing in will have relatively hot emulsion before you start chilling it (so you’ll probably not want to use glass). I started by deciding to use a two-reel stainless steel developing tank for the emulsion. I also pulled the light bulb out of the fridge so that I wouldn’t have to worry about light pollution in my darkroom (basement), and could easily put emulsion in the fridge without fear. Second, ingredient prep. Most of this is straightforward, but the potassium bromide tends to come in chunks. I ground about 20g of it in a mortar and pestle (dedicated for lab use, just like the ricer – no food products here), then measured out the two quantities of potassium bromide. And there’s one more important step in the middle that needs attention up front. You’re going to start by making two solutions, and then you’ll need to slowly add one to the other – at an even pace, over the course of 10 minutes. Unless you have a titation burette (which I now do, but I didn’t when I did this the first time) that’s going to be a little challenging. I decided to use 12 ml syringes (I have a box of 100), filling 6 of them to the right levels so that I could grab one, slowly empty it, drop it in a beaker and move on to the next. And I used a metronome app on my iPhone to tick off time so that I could keep pace. I set up the metronome when I started and let it tick the whole way through the process, with the phone sitting face down in case someone tried to call me while it was ticking. All that being done, I dove in to the process. It starts under normal room lights. Make an 0.2% solution of hypo (ammonium thiosulfate). You need 1ml of this, and making just 1ml is a pain. It’s easier to make 100ml and store it in a plastic or glass jar. Heat up solution A in a water bath until it reaches 120 F (50 C). As it gets close you’ll see the gelatin become increasingly transparent. Add 8g of potassium bromide to the warmed gelatin (reserving 0.5g for later). Stir continuously until dissolved. Set up a beaker with the muslin cheesecloth over it so that you can filter the emulsion when you’re done mixing it, and have a liter or so of distilled water ready to rinse out the film container. And now the fun begins. The rest of this is done under a safelight. Slowly add solution B (the silver nitrate) to solution A (the gelatin). You want to add about 1 ml every 6 seconds, as evenly as possible, so that the entire process is complete in about 10 minutes. Stir continuously (I stirred by hand using a glass stirring rod). When the two are completely combined, pour it through the filter. Give the developing tank a quick rinse with distilled water to remove whatever is stuck to the inside, and then return the filtered emulsion to the developing tank. Put the lid on the developing tank and stick it in the fridge for about 20 minutes to let it set. You can clean up from the first half of the work now. The emulsion is in a light-tight container inside of a fridge, so it’s safe to turn the lights back on. Just remember to go back to the safelight before you continue. When the gelatin is set, you need to wash the emulsion. Pull it out of the fridge; pry it out of the tank; run it through the ricer, pushing the “noodles” in to a 1L glass beaker. Using a rubber band, cover the top of the beaker with the fiberglass window screen material. Pour a liter of cold (50F or lower) water in to the beaker; agitate a little, and let it sit for 3 minutes. When you’re done, dump the water out (with the screening on top, it’s easy to do this and not lose the emulsion). Repeat this process 3 or 4 times, using distilled water for the final rinse. Put the washed emulsion back in the developing tank and re-melt it in the water bath. Add the last 0.5g of potassium bromide and stir until it’s dissolved. If you’re not going to use it immediately (within a day), you’ll probably want to add a few drops of 10% thymol as a preservative. And now you have a homemade emulsion, ready to use. Its ISO is dependent on the speed at which you added Solution B to Solution A, because the speed at which it’s added controls the size of the crystals formed in the final emulsion. You can develop this stuff in Dektol, about 90 seconds, and use a hardening fixer for at least 4 (not more than 8) minutes. From here, it’s easy enough to coat the film (or paper, if that’s what you’d prefer – coat anything it will stick to!) and let it dry. 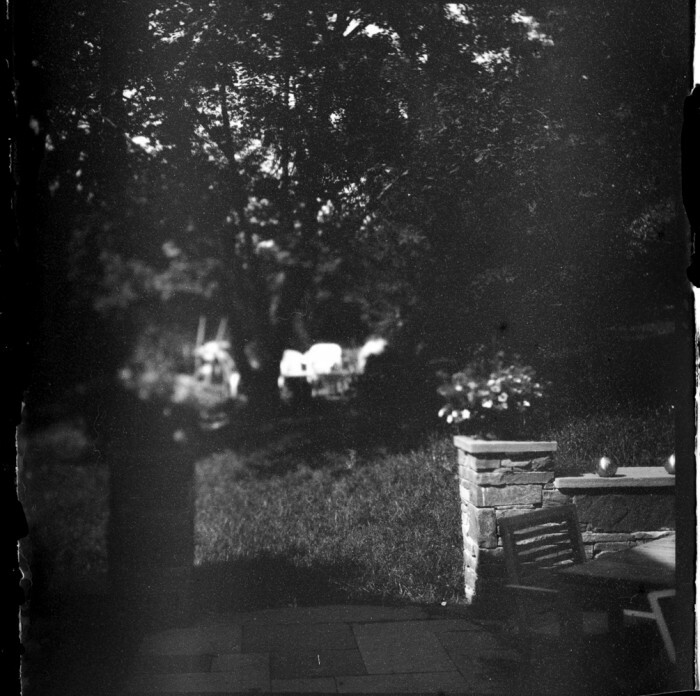 I used about 25ml of emulsion to coat about 7 square frames of 120 film; that was too much, but it worked reasonably well. Let it dry thoroughly (it took about 8 hours) and tape it on to used 120 film backing. Spool and shoot!